This website charts my journey as I travel the globe from my armchair, by reading contemporary literature - a trek that I started in London, England back in May 2009. At this time it occurred to me that whilst a real-life trip to every country in the world would be impossible due to lack of time, work commitments - and the cost! - I could explore the globe through literature, in the company of international authors. In doing this I mapped out a travel list of well over 270 destinations to visit (every UN recognised state and a few, more contentious, ones...) and have been reading a book from each country as part of my literary expedition. For particularly large countries such as China and Russia, I am reading a book from each major region of that country. In the above sections you will find details of all the countries that I have visited and am planning to visit - as well as reviews of the books that I have read and details of the authors and publication dates. PS - if you like my website, please take a second to like my Facebook page too! Click here. You are welcome to explore this website and join me as I travel the world through books! 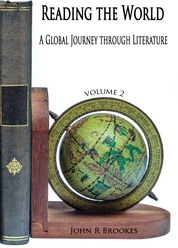 "Reading the World: A Global Journey Through Literature - Volumes 1 and 2"
Ironically, my literary tour of the world by reading books is now in print itself! I have now written up my travel experiences of my first year of the journey from 2009 to 2010 - which took me from England to Russia, and my second year from 2011 to 2012 from Russia to Africa. Because I wished to convey a real sense of travelling to and through these countries I determined to do at least some background research on each country before reading its accompanying book, as well as looking into exactly how one might travel from place to place. I have detailed these elements along with my reviews of each country’s book in the publications, and it has been fascinating to note the often convoluted means that one needs to take to travel across a simple land border due to a region’s politics (prime examples being between Israel and Palestine, and Kosovo and Serbia). The book is available for purchase from Amazon as a paperback or Kindle eBook. Click on links below to order!